Girls born into this century are so lucky. Not only are we able to go to school, we are also able to lead in many things, including business, politics, sports and the sciences. Even so, we still have quite a ways to go before we can be seen as equal to the guys—equal enough in pay for equal work; equal enough in strength to fight a war, equal enough in power to lead a country. But this wasn’t always so. We used to be educated equally with the boys, not only mentally but also physically. We used to be equal partners in relationships. We used to rule entire nations. We used to head businesses and establishments. We were equal human beings back in ancient times, if not all over the world, then at least in my ancient land of Lạc Việt. My ancestors were, without a doubt, egalitarian. Back in the old days, nobody cared if a child was boy or girl because both were equal in the eyes of the laws and of society. Talk about ultra-modern thinking, my ancient ancestors were super hip, super cool, and super progressive. We’re still trying to get back to that state of mind, but we’ve slipped quite a bit for thousands of years. Back in the old days, a girl would receive the same kind of martial arts training as the boys, and if they were smart enough and good enough, they could lead a country—they could become queens. This was exactly what happened. Most standard accepted history books do not have this clear information about the sisters, but that is because history is written by the victors, and sadly, victors, we were not. However, the sisters are so well-loved by my people that we continued to transfer the missing pieces and bits of their lives down through the generations via oral traditions, historically-accurate poetry, and hidden messages within mythologies and children’s lullabies until one day, it could be recorded correctly, allowing their complete story to be told, without the muddy passage of time and human inventions. On a hot August day, the first of the month, in the year 14 AD, two little twin girls came into the world and was named by their proud parents Trưng Trắc (徵側) and Trưng Nhị (徵 貳)—their original family name being Lạc but later changed to Trưng. This meant that they were direct descendants to the kings of Lạc Việt, the Hung Kings. As befitting the royalty, they were educated in the royal manner. Swords and martial arts by day, books and penmanship by night. There were no breaks. No weekend shopping sprees. Their education started as soon as they could walk until they were old enough to command a region (or get married, which ever one came first). Although they were twins and were technically the same age, the eldest by a few minutes, was Trưng Trắc, and the first part of the story revolves around her precisely because of these few minutes of birth before her sister. As the eldest in a royal line, it fell upon her to be the bridge upon which two neighboring areas could retain peaceful relationships. This meant that at least for her, there would be no choice in her marriage affairs. It would be a matter of diplomatic exchange. This did not have anything to do with her being a girl. The boy who was being affected in the matter would really have no choice either, so it really didn’t matter what the gender was. It only mattered what the lineage was. As with any young girl, the idea of marrying some strange man was less than appealing, but Trắc braced herself for it. She knew that her duties to her country came before her own wants and needs. She also loved her twin sister, and if it came down to the fact that either she took up the responsibility or her sister had to, there was no way she would put her sister through this. Arranged marriages, especially those of the royalty, were mostly a resigned and reluctant situation for both partners. Love did not come into the picture, only filial duty and a deep sense of patriotism. So it was that on the day the groom came to visit her family, she was groomed carefully and was presented to the groom’s family. Since it was a preliminary meeting of the nobles, no sign of her future husband was to be seen. Along with the groom’s royal family, there was an entourage who came along to care for and protect the royal family. This included guardsmen, serving ladies, hand-maidens, and of course, the royal physician. Sitting there in her stiff and heavy garments, the flowers wilting in her hair, Trắc was not only bored and uncomfortable, she was also filled with dread and apprehension. Her expression must have been clear because she got several sympathetic glances from the hand-maidens and also the physician’s wife. At first, Trắc kept her eyes demurely down-cast, but as the initial congregation grew longer and more boring by the minute, she began to look around at the entourage that filled her father’s ante chamber. There was the head of state, and there were all the heavily-armed guards, not there to protect but to show the might and power of the land beyond her family’s land. They were, after all, allies and comrades-in-arms. There was the physician and his family. The physician, looking just as bored as she felt, caught her eyes and gave her a smile. She returned the smile and looked beyond his grey grizzled head to his wife and their son. The son, who had been staring at her, quickly dropped his eyes bashfully, his shyness abundantly apparent. He was older than her, but not by decades, only by a handful of years, and he was very handsome. Her smile quickly dissolved. She could not think in such terms. She was going to marry someone else and she had to accept her fate. Suddenly, she felt someone else’s eyes on her. It was the physician. He had seen the quick exchange between his son and herself. His eyes were kind. Perhaps he would not give her trouble over this innocent non-verbal communication. The meeting dragged on. The only ones who had been given any drink or food were the visiting statesman and her mother, who was the head statesman at this time. She was presented to the statesman and formally introduced. This was technically the point at which he would either accept or decline, on behalf of the groom’s family, but everyone knew that it was just a formality. The plans had been laid out since she was a child, and now that she had passed her sixteenth birthday, it was time to formalize everything. By the time the meeting was concluded, she was starving. They all went to the royal dining hall and a feast was waiting. Since she was now technically a part of the other family, having been accepted as such, she had to sit on the side of the other family. The visiting statesman was on one side of her, the physician on the other. That was going to be a joy. She was going to have to be looked over by the physician after this. It was a dreadful thought, but there was no way to get out of this one. They had to assure the fact of her virginity. This was absolutely required because she needed to give them an heir that was most assuredly, theirs. During the entire meal, she found it uncomfortable and difficult to enjoy all the food that was available and transferred to her plate by the serving ladies. Not only was she flanked by these terribly important men, the physician’s son, who was sitting next to his father, was also a presence she could not ignore. He attracted her like no other male in her family’s lands. She had never seen such handsome features on a young man. This was going to be so hard, having to face him in and around the royal grounds when she became someone else’s wife. After dinner, the two families toured the gardens, with the statesman and her mother, ahead, discussing various political situations and clashes that were occurring around their borders at the foot of the Ngũ Lĩnh Mountains (南岭), or The Five Ranges which separate the current north China from south China. By this time, in 14 AD, the Red South that was the old Xích Quỷ (赤鬼) of Lạc Long Quân, aka Hùng Sùng Lãm, and Âu Cơ had shrunk due to occupations and sacking from the northern Hans and was no longer the great land it once was, when Lạc Long Quân took Âu Cơ to Lake Ðộng Ðình on their honeymoon, circa 2,800 years in the distant past. 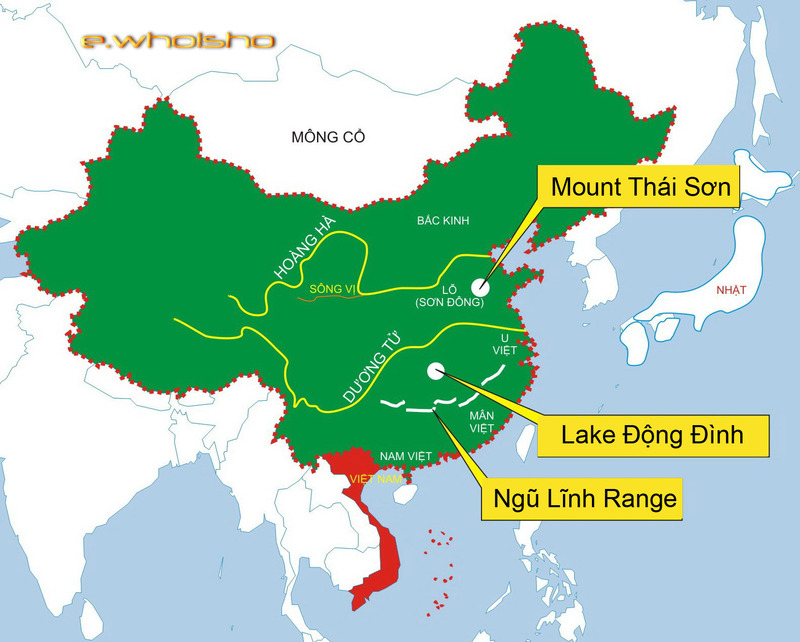 All the land that was south of the Lĩnh Nam Range of mountains (Lingnan Range) had been under the military occupation of the Han Chinese from the north for about 1,500 years, and although small skirmishes were taking place here and there, it was small and unorganized, so success was never possible. The Viet people were slowly being pushed downward, towards the far end of the southlands and it was with great difficulty that the people were living their day-to-day lives. Trắc listened in on the conversations half-heartedly. It was all politics, and all of which she was very well-versed. There was nothing new to be learned here. She found herself dropping behind as the group explored the grounds, until she was with a group of her own hand maidens and the small group of serving folks from the visiting family. Suddenly, she found herself walking next to the physician’s son, and although they said not a word to each other, she was filled with great joy. The next morning, her mother commented slyly on how well she got along with the other side of the family, most especially the physician’s son. Trắc immediately denied any concerns, stating with vehemence that she was patiently awaiting the arrival of her future husband, to which her mother replied with great amusement that she had, indeed already met her future husband. He was the physician’s son!